Use The 3-2-1- Daily Contact Plan as a start-point for over-coming inertia and moving your Watkins Business forward with consistent and disciplined effort. This plan is for Associates who are new to the business or for Associates that want to “jump-start” a business that needs a boost. This is a “rubber-hits-the-road” plan. It is a basic tactic of business development. It is not a long-term Business Development Strategy with Time-Lines, Major Goals, Vision Statements, Marketing Strategies and other aspects of business development that may be addressed later. For now, to get things kicked-in-gear, this is what we suggest you accomplish each day- beginning today! Discipline yourself and follow this plan and you will see progress. Do not let the 101 distractions of the day keep you from achieving The 3-2-1 Daily Contact Plan. Work this plan faithfully six days of the week (Monday through Saturday) and you will begin to experience small successes that will feed greater successes. You will gain momentum. We suggest that you commit to this plan for the next 60 days beginning today! After 60 days assess the yields and then decide your next course of action. CONTACT THREE (3) NEW PROSPECTS EACH DAY: This may be accomplished by meeting strangers as you go about your errands for the day. When you leave home to go to the Post Office, Pharmacy, Super Market, Doctors Office, or any other place, look upon that trip as a Watkins Sponsoring Expedition – an opportunity to meet people and share a remarkable possibility with them. As I write this message I have just returned from a quickie trip to the pharmacy for Fran with a brief stop at the supermarket. I presented the Watkins/Summit Group Opportunity to two strangers. I used to grumble about “running errands.” Now I look upon my errands as a remarkable opportunity to meet people who may be seeking just what we have to offer. Special Note Related to your Federal Taxes: When you are running errands it is wise to keep a mileage log in your car. Record your destinations, dates and mileage for your daily journeys and note when you conducted business by distributing information and giving out samples. Some of these miles traveled may have tax implications as business expenses. That means you may benefit from a larger refund check at tax time. Money in your pocket is a good thing! Check with your Tax Professional for guidance and compliance with IRS (USA) regulations! The key is to “integrate” your sponsoring activities with your other responsibilities. Get creative and turn many of your frustrating “distractions” into Business Builder Opportunities. Of course, many of your THREE NEW PROSPECTS for the day may come from various forms of advertising that you have placed or from referrals from your friends, etc. CONTACT TWO (2) CANDIDATES EACH DAY: Follow-up with Candidates who are showing interest in the business. Answer their questions. Provide additional information. Send notes of encouragement. Stay in touch! CONTACT ONE (1) TEAM MEMBER EACH DAY: Just check in and say Hello. Use this time to coach and encourage your team. Consistent communication is critical. Of course, those who are brand-new to the business may not have any team members but if they sponsor consistently that will change soon. When you speak with your Team Members encourage them to employ The 3-2-1-Daily Contact Plan. Keep track of your 3-2-1 Daily Contact Plan Activities. Discipline yourself to contact three Prospects, two Candidates and one of your Team Members each day. No excuses – simply do it. If life gets-in-the-way and you miss a day – then you should double up your efforts so that you meet The 3-2-1 Daily Contact Plan Goals for the month. Just think about it! You will be working about 26 days per month. That is 26 days multiplied by 3 = 78 new Prospects contacted. That is 26 days multiplied by 2 = 52 follow-ups to Candidates. This represents 26 days multiplied by 1 = 26 coaching calls to your team members. Each day, when you start your Watkins/Summit Business development activities, simply use: The 3-2-1 Daily Contact Plan. It will give you a great start to every day! The yield from this level of activity may be very encouraging. Unbelievably, all of this may be achieved in a relatively short period of time each day if you are creative in your use of time and completely “conscious” of your desire to build a vibrant and highly profitable Watkins Career. Look around you. Every-which-way you turn there are people who could use our remarkable opportunity. Do not deny them what Watkins/Summit has to offer. • Remember – the next person you meet (who enrolls in Watkins) could change your life financially forever! • Remember – the next person you meet (who enrolls in Watkins) may have his or her life changed financially forever! Adjust Your Daily Contact Plan Activities as your business expands. As you introduce our opportunity to more and more people you will increase the number of Candidates that you have. You may find yourself in the position of changing your daily contact goals to a new set of numbers. For example: The 3-5-2 Daily Contact Plan. That is: Three New Prospects, Five Candidates and Two Team Members contacted daily. I am not trying to play cute with numbers but simply want to demonstrate that you must be flexible and adjust to changing circumstances. The gist of this whole approach is to have a basic, doable plan that you can achieve each and every day without fail. However, I feel that a serious Watkins/Summit Business Builder Associate should strive for the The 3-2-1- Daily Contact Plan as a minimum each day. For those new to the business this is an excellent start-point. For the next 60 days FOCUS, FOCUS and FOCUS on then FOCUS some more on The 3-2-1- Daily Contact Plan. Accountability for your 3-2-1 Daily Contact Plan. – How will you hold yourself accountable? It may be wise to send a brief paragraph each week to your sponsor and upline leadership telling how well you did in achieving the goals of 3-2-1. This is not a requirement but will help you hold yourself accountable. It will help to reinforce your discipline. 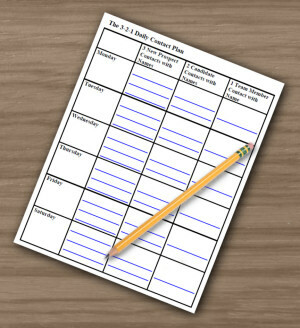 You can also click here for a Log Sheet which you can print to track your daily efforts with the 3-2-1 Contact Plan. When you are genuinely focused on the activities of The 3-2-1- Daily Contact Plan you will be far less distracted. You will not have time to have thoughts that tend to hold you back. Consistent, persistent, goal-oriented activity will move you through any periods of doubt, discouragement or disappointment. Most importantly, this level of activity will start to yield results that will be very encouraging. Building your Watkins Consciousness. Of course the major goal of The 3-2-1 Daily Contact Plan is to keep Watkins/Summit at the forefront of your thoughts. If you are conscious of Watkins on a daily basis you will be more likely to take action and see your business grow. Product Use and Product Knowledge. Another way to build your Watkins Awareness is to focus on using Watkins Products every day. I do not know of any successful Watkins business owner who does not use the Watkins Products everyday. We must become products of the products. It is a matter of integrity. We simply can not represent our illustrious product line if we are not ardent consumers of the products. Great article, Dave and Fran! Any Watkins associate who follows your 3-2-1 recommendations can easily move forward with their business to show more results, rather than wondering about what they should do on a particular day. Thumbs Up. I downloaded the 3-2-1 plan sheet. Love the article, I now printed the sheet, I am heading out for the 3 oclock rush at the stores, great time do to schools are getting out. Have a great week yourself. 1 hour a week on the phone with customers or leads. So far I have 2 sales this week and I thought I had a recruit signing up yesterday but she must have gotten cold feet. I will give her a day and call her tomorrow. I get lazy about talking to people (about the business) even when I’m talking to them–don’t know what that is, but hopefully my Lead Nazi Log Sheet (thank you very much!) will keep my mouth focused….making the calls for some reason is so hard to do, but I’m forcing myself and is how I got the 2 sales so far. they’re small but they are sales, and one is a returning customer and the other is a new person, both good things. Thank you for your great help and blog!